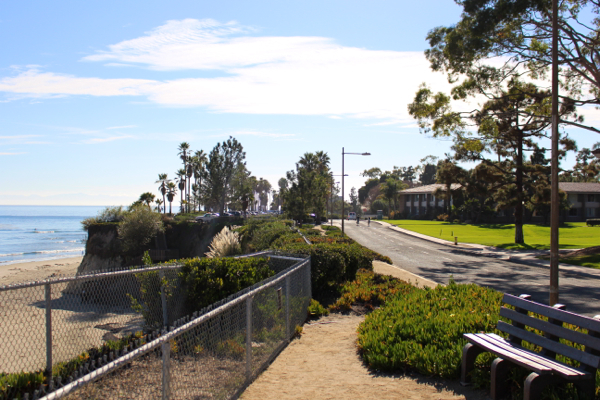 This is what I get to look at on my walk from my classes to lab meeting. Not too shabby, eh? I have now been back in school – doing a masters program in biology focusing on macroevolution by the way, because I think I never actually mentioned that – for all of one and one half weeks. And HOLY MOLY is my life completely different. I’ve spent the past nearly 5 years working for myself, blogging and freelancing, raising Waits and writing wherever and whenever I can. Working from home has its pros and cons, but I’d definitely forgotten what it’s like to have a more traditional – a more rigorous – schedule. I forgot how much I love it! 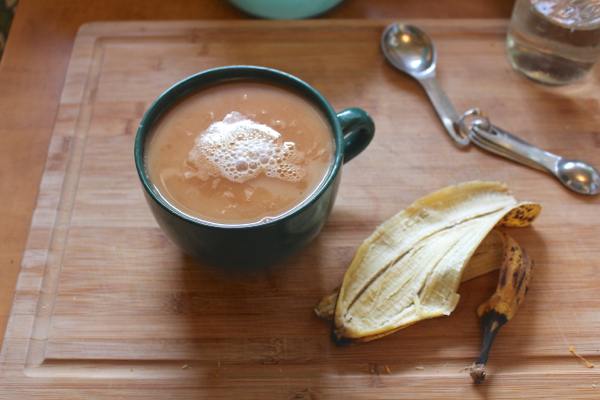 Black tea with the best liquid stevia and almond milk, remnants of a banana that went into a smoothie, measuring spoon evidence of the 2 tablespoons of ground seeds I ate, for seed cycling. Things are so different these days. We run a tight ship, there’s lots to remember and not a lot of time to remember it in. I’ve got a million things on my mind and I’m always thinking one step ahead. Or two. 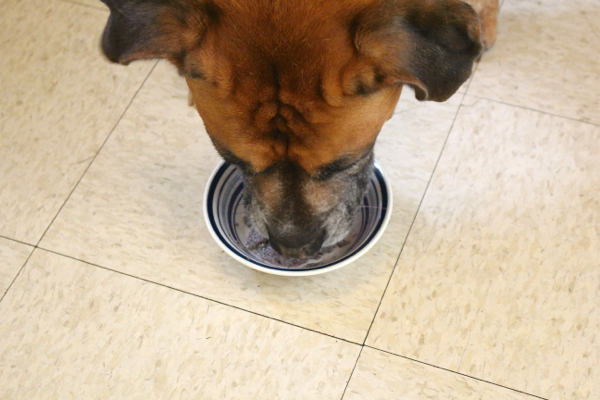 Waits is on a chia kick. 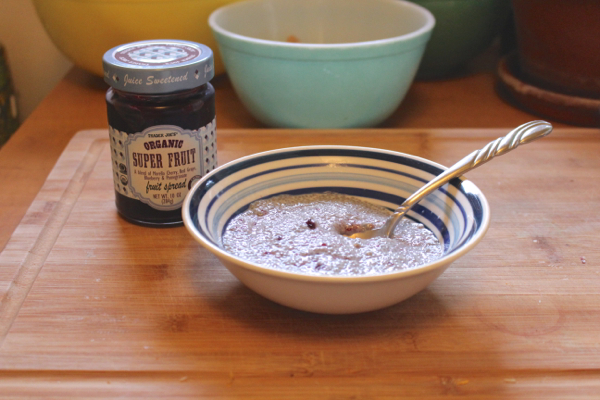 Every morning, chia chia chia. Almond milk, banana, tropical fruit, strawberries, spinach, vanilla protein powder (not my favorite, but a better price), and vitamins. 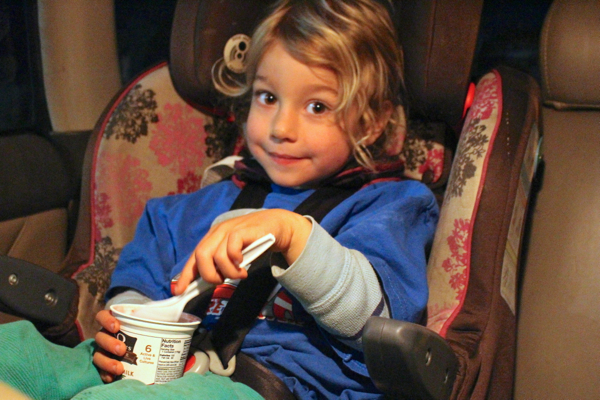 For Waits –> second breakfast for preschool. For me –> tall shake for breakfast, which I drink on the way to school. For Jeremy –> half size for half of his breakfast, along with a bowl of soy yogurt. While I bustle about the kitchen, Waits eats breakfast and plays. 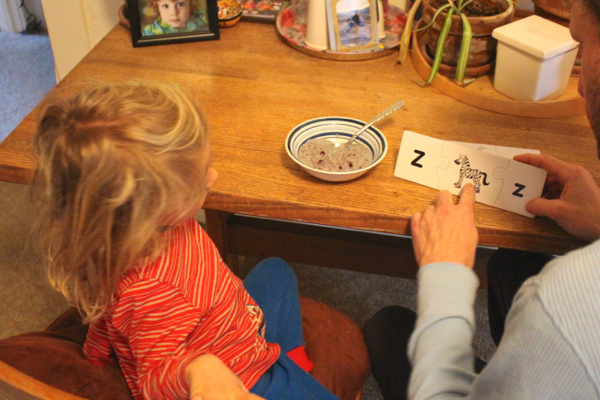 Our new year’s resolution for him was to work on his letters and spelling, so on this particular morning, he and Jeremy played letter matching games while they ate. I pack up lunches. The preschool has transitioned to a different style of lunching, where instead of each child bringing a bunch of different food for themselves each day, they bring one larger dish to share, and everyone eats everything, together. I love the concept but worried, at first, that Waits would be left out. I really underestimated the other parents. So far, roughly 95% of the “sharing” food has been vegan. The other parents have completely embraced it, without being asked at all. They’re just thoughtful, and want Waits to be able to eat what everyone else is eating. So they send vegan snacks, fresh fruit and veggies, nuts and beans and hummus and sammies, even homemade vegan baked goods! Doesn’t that just warm your heart? People can be so dang good. 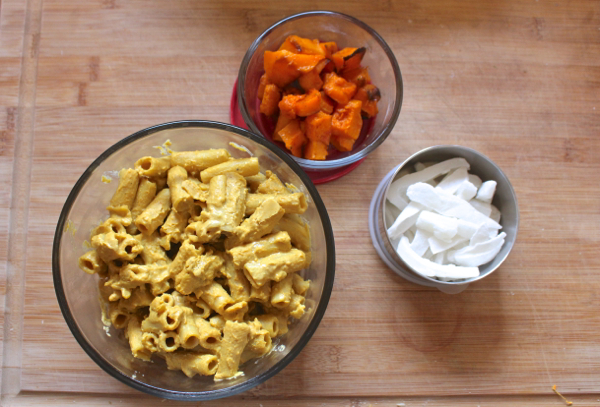 Waits’s share snack on that day: homemade mac ‘n red pepper cheese, and a small side of leftover roasted butternuts. The tin of coconut strips is his “not-sharing” snack, because I always try to send him with a good solid source of calories/energy that I know he’ll eat (since he can be picky). 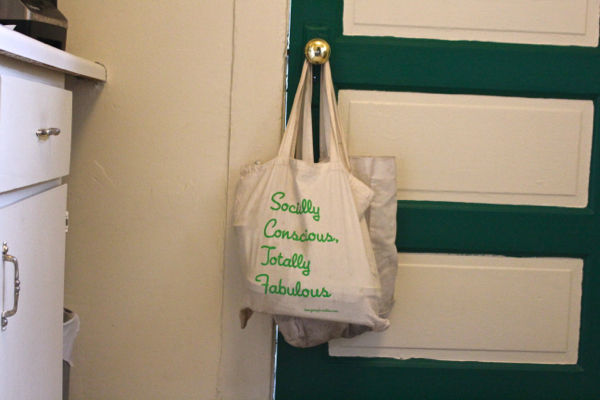 Our lunch bags hanging on the back door, ready to go. And of course, before we rush out the door, we can’t forget the dog! Whew! And then we’re out the door. I drop Waits off at preschool, say my sweet goodbyes, and head out to campus. My first class is at 10. I love being in class. Right now grad school is still new, still overwhelming, still seeming like an enormous financial burden and oh my god did I make the right decision what am I doing wait get me out of here! But then I get into class. As soon as the learning starts, all of that fades away. I love science. I LOVE IT. I love the way it makes my brain feel, just like a tense and tired muscle after a heavy workout, tingling from the adrenaline and the growth. When I’m in the classroom, I know I made the right decision. My first class is over at 10:50, and by 11 am I’m back in my car. 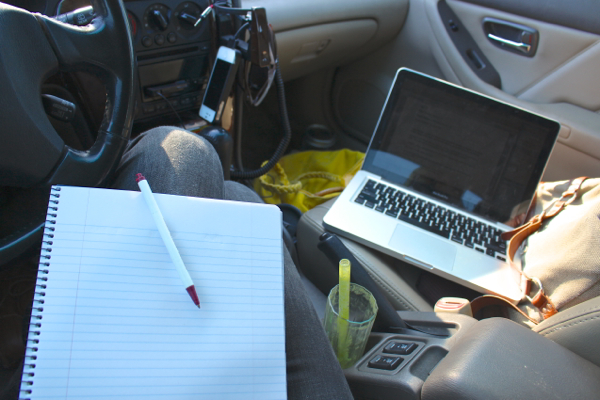 Car is home base on campus, my little introvert respite, my rolling office where I can get all my work done in peace and comfort and quiet. See? I work for an hour, prepping for a phone call with a new Vegan Lifestyle Coaching client. And don’t feel too bad for me, holed up in my car. The view’s not so bad from the top of the parking structure. At noon I break for lunch. Leftovers! 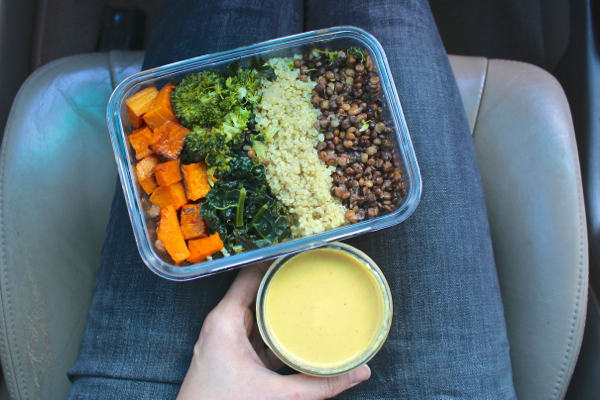 Roasted butternut, steamed broccoli and kale, quinoa, and lentils, with a side of homemade sunflower-horseradish sauce. YUM. Perfect brain food. After lunch I do more working working working in the car; on this day it was another hour. But I was getting restless. 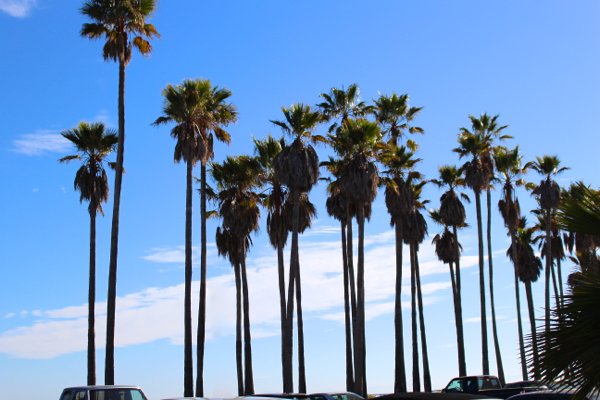 How could I resist the siren call of a perfectly perfect, perfectly sunny and warm and still southern California winter day? Feeling cramped and getting sleepy. 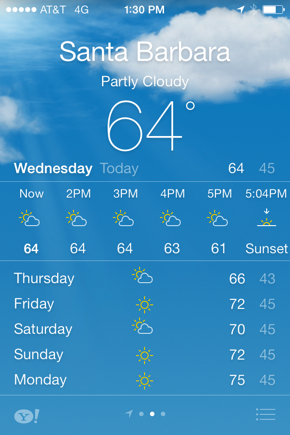 // Not bad for mid-January, I’d say. I’ve been enjoying a mid-day walk to break up the grind, and I always need more caffeine. 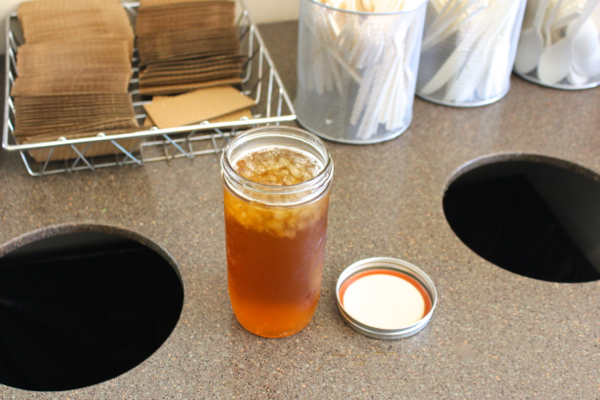 So on this lovely winter day, I grabbed my tall glass mason jar and moseyed on down to the UCEN. Black iced tea with my favorite portable powdered stevia. And then a little walk around campus . . . 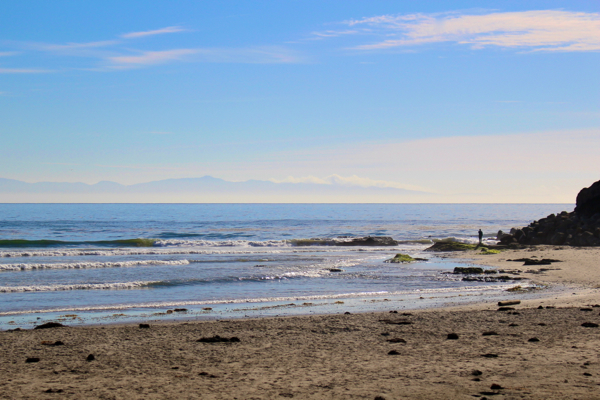 I feel grateful, each and every day, that I get to live here. I never forget it. After my walk it’s time to head to class. And after class it’s back to my car for more working working working (I still work for myself, still write freelance, still have deadlines to meet), until it’s time to go pick up Waits. And on the way home with my sweet baby boy in tow, on this particular day, we had to stop at the market. Because it was taco night, and what is taco night without avocados, I ask you? Waits was hungry so I grabbed him a coconut raspberry yogurt for snacking on the drive home. So, once we were home I realized something very important, which is this: the thing about tacos is that they require, well, tacos. Taco shells. Taco shells are sort of a necessary part of taco night. Which I didn’t actually have. I’m trying to keep too many things straight, I guess. That’s okay – I can improvise! 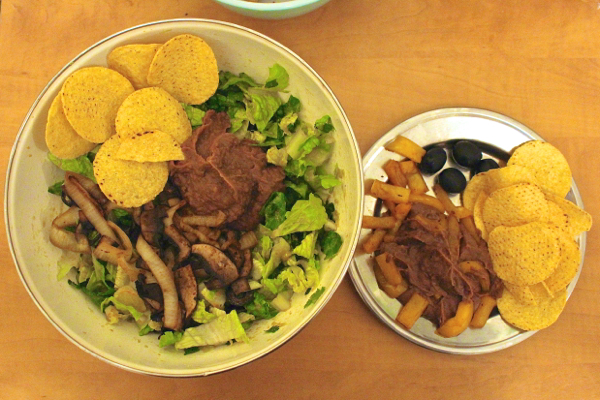 Taco salad for me, and a little dipper plate for Waits, with refried black beans with olive oil and nutritional yeast, sautéed orange bell pepper, black olives, and organic corn chips for dipping. Oh crap, I almost forgot the avocado! Much better, whew! 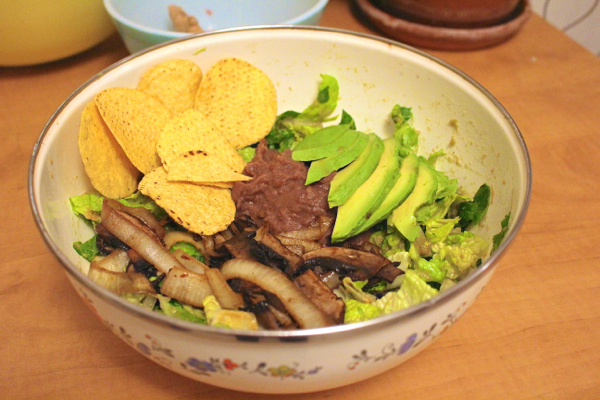 Romaine with refried black beans, sautéed onions and portobellos, black olives, salsa verde, nutritional yeast, and topped with a few organic corn tortilla chips for maximum crunch. Oh and of course, avocado! A whole half of one. Because delicious. Waits and I eat, play, bathe, and get ready for bed. I love our nighttime routine. Later, much later, after Waits is asleep, I make an identical dinner for Jeremy when he gets home (my home, not his – we don’t live together in case that’s confusing), close to 10 pm. And these nights, just about all we can do is curl up in the living room and talk, so tired from our long days, but just so glad to be ending them together. I am lucky. Some days, these days, I don’t know what I’m doing or where I’m going or if it’s right, but I do know that. I am so lucky. So excited that you’re back in school, lady! 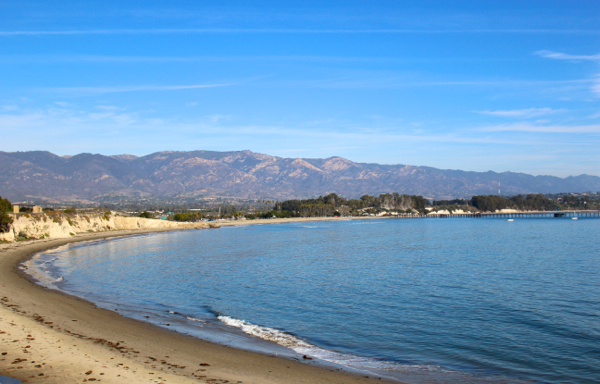 And boy oh boy, are you making me pine for Santa Barbara. And I’ve been loving your instagrammed school lunches. Brown bagging it is one of my favorite things about working away from home. Nina is in charge of taco nights at our house – my girl makes a mean guacamole – and she’s also really into “deconstructed” dishes (totally the influence of Top Chef Las Vegas) – so all of our taco nights revolve around giant bowls of shredded greens mounded with all the fixins’ and chips crushed on top! Loved this post :) reminiscent of how I felt most of the time in grad school… and a lot of the time now that I’m working. Busy busy busy; always planning, always being productive, always juggling, and often forgetting something that’s no big deal – “but it’s ESSENTIAL!” yells my brain until I realize it’s usually replaceable. Such as taco shells and corn chips. As always, you give me inspiration and hope. If someone who also has a young child can manage their life outside of school, I can do it too! Now if I can just convince my hubby that it’ll all be fine. Granted, he is being so supportive of me, despite the fact that he really doesn’t want to move to D.C. Now if I can just get that application finished. Ha! I used to eat a similar lunch/dinner in the same container in my car when I was in carpentry school. I didn’t have a stunning view and it was winter in Canada but your picture took me back. Yup, introvert finding quiet from the crowds of students. My classmates would sit in the hallway on breaks and I always found it too overwhelming. I love that you are sharing this journey with us. 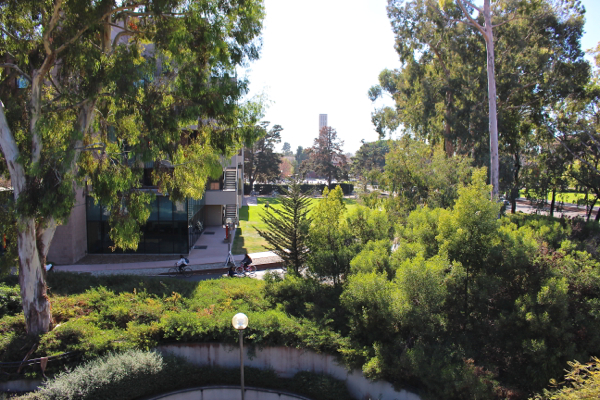 All the talk about classes and the shots of campus make me feel so nostalgic and desirous of being back in school. For now, I’ll live vicariously through you! I usually packed my classes in tightly so I didn’t have gaps between and studied at home (in the dorms the first 2 years and my apartment the 4th year–the 3rd year I studied abroad in France). I eat breakfast and lunch at work every day and generally pack those up the night before. 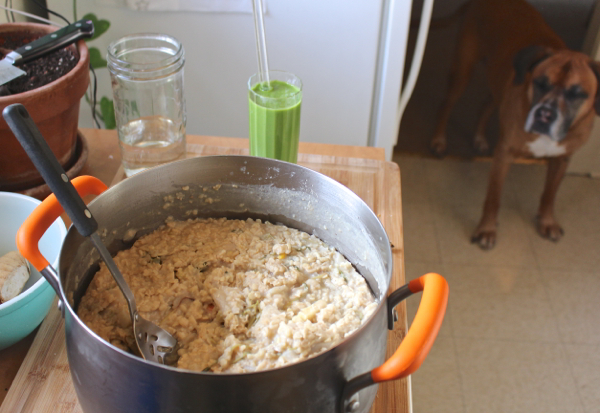 It’s fun seeing how you manage feeding three people with different needs and schedules in a healthy, delicious way. More than anything, though, I love that you have created this beautiful family and are so radiantly happy. Exhausting and energizing = exactly! Always great to hear from you Rachel! Oh Courtney, you can! It’s not easy but so many women do it. My mom did it before me, and so many of my peers. I think it sets a wonderful example for your child, too, to see mom pursuing higher education and a passion. I’ll always remember watching my mother study, hearing her typewriter from the living room late at night, and knowing that what she was doing was difficult and brave. It’s an awesome thing to show our babies! yes fellow introvert! I love the bustle of campus but it can be quite stimulating and draining. Glad I’m not the only one who seeks solace in my car, ha! Let me know if you get in, and I’ll be sending my positive thoughts your way! Aw thank you Manda, I LOVE hearing form other fierce mamas who have blazed this path before me. And I love hearing how you think back so fondly on that time. I imagine it will be the same for me. Sometimes the most intense times are really the most wonderful times – everything just feels so *alive*! 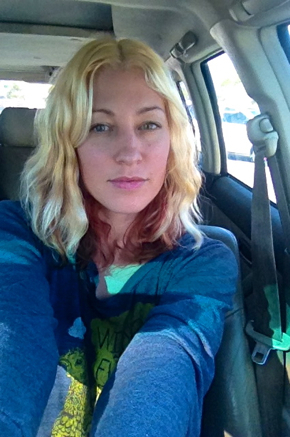 I remember spending a lot of down time in my car when I was in college too! That taco bowl looks pretty fantastic! Sayward–thanks so much! I’ll keep you posted on my progress! Fingers crossed! Hi Sayward. I’m trying really hard to drink less sugary drinks but still need my caffeine, so I was wondering what brand of black tea you would recommend? Thanks! 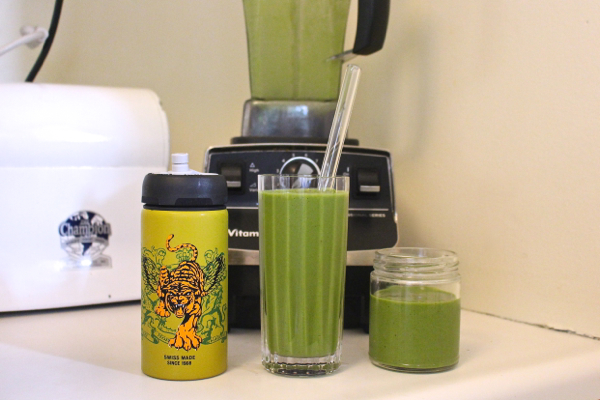 I just drink the Trader Joe’s stuff – it’s so cheap! ‘Harleys new years resolution was to go vegan’? No. That was your resolution. Dogs are not vegan by nature and I think that’s pretty cruel, to deprive an animal of its natural diet. If you can’t deal with caring for animals that eat other animals, you ought to stick to herbivorous pets.